Do you have books stacked in every room of your house or are you strictly a believer that books belong in bookshelves? A little bit of both. I prefer books on bookcases and my husband whose a major neat freak and minimalist definitely prefers it that way BUT I have too many books for my bookcases and right now not enough room to put more in. I have plans to turn my daughter's room into a reading room now that she's left for college but I've got a few rooms ahead of it. In most of the rooms books are only in bookcases but in my bedroom they're crammed in just about every corner I can get them! This week's book is Pies and Prejudice (don't you just love the puns in cozy mystery titles!) from Ellery Adams. This is the first book in the series and I've been really looking forward to it for awhile. There's a little magical realism, food, a woman looking for a fresh start AND a murder! It's all stuff I love and so far I'm really enjoying it. It is making me want pie (which to be honest isn't that hard) and there are recipes in the back so pie will be being made soon! Ella Mae LeFaye Kitteridge slammed a ball of dough onto the countertop, sending a snowstorm of flour into the air. I have frequently felt this way when making pie crust. It does not bring out the best in me! "I like all the pockets. It feels strange not to have gum or Lifesavers or my phone on hand." This made me laugh as the speaker is complaining about wearing a dress instead of her usual attire which has pockets. Why is it that the majority of women's clothes have no pockets that can actually carry anything? That means I either have to carry a purse which I hate or have my husband play pack mule in which case I have to remember to get my stuff back. It drives me crazy! So what do you think? Keep reading? Our you a bookcase only person or a cram in every available corner person? Oh, I love pies, so this cozy sounds tempting! Thanks for sharing...and I also have books all over my house, but on shelves....except for a fairly small stack on my coffee table/trunk in the office. My "Up Next" books, as if to inspire me to pick them up. Pies and Prejudice looks cute. ENJOY!! Most of my books are on my MANY bookshelves, but some are in bins since there is barely any room on the shelves. I tend to like my books in bookshelves just so they don't get wrecked but I've been known to have, um, a pile here or there. :) It's a little better now that I'm reading e- books because I'm noy buying so many physical copies, but yeah... space can be an issue. This one looks fun, I'm still on her Books by the Bay series (I read them occasionally when I'm between other books) and stormi has been reviewing her books too. I do like her writing style and her characters for the most part. Great play on words in the title. Hope you enjoy this book and others in the series as they come along. How cute! Happy Labor day weekend! Pies and Prejudice sounds delightful. LOVE that title! Great description - "snowstorm of flour." I can't remember the last time I wore a dress, but not having pockets would bug me too. My Friday post features BAREFOOT AT SUNSET. Love the title and would definitely keep reading. 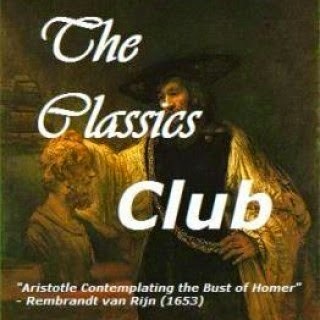 Great title and I can relate to the beginning as well. Happy Friday! Pies and prejudice. I love it! Good luck on turning your now extra room into a reading room. One of my relatives has a room that is basically a library and I am very jealous. My house is too small for anything like that. Yup, that's pretty much the "system" I have regarding books, lol. I have bookcases, but still have stacks in the living room and bedroom. And MY husband is a neat freak, too!! Lol. The book you've picked this week has a very funny title, and the cover is SO cute! I really need to read some cozies. They all have interesting plots, and are not heavy on the drama, it seems. Growing up I had two aunt's whose bedroom was like yours. Though they had bookcases everywhere, they were always full. So it was their bedroom that usually held all the excess books until they could find more room for them. I'm hoping to buy a house in a few years and do some construction to have bookcases put into the walls. The house I grew up in had that in the living room and it saved so much space! That about describes my bedroom too. LOL Books everywhere. I do prefer to have my books on shelves, but I can't say those books are always neatly shelved. Especially if they happen to be my daughter's books. 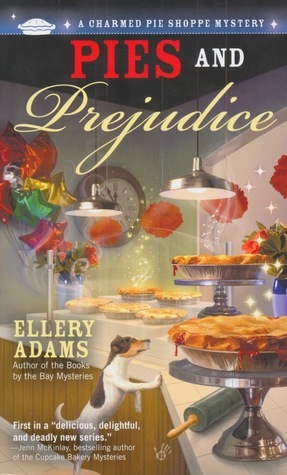 I love the title Pies and Prejudice and what a cute cover! I'm still putting off my cozies . . . I really need to dive into one sooner than later. I keep eyeing them. Yes I have a feeling that exactly what is going to happen to me if I keep on buying more books, my mom is also a neat freak and she just get upset when I buy more books. Because she knows that I am running out of room in my bookcase that they are going to be stacked up all around my apt soon. 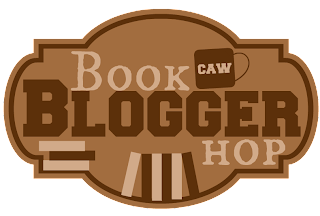 lol :D Thank you so much for stopping by my blog hop.